2017 SAN DIEGO COMIC CON EXCLUSIVE. 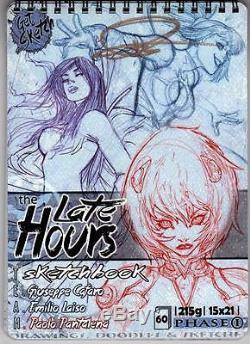 Paolo Pantalena / Laura Braga "Late Hours Sketchbook" Includes added Original Art drawing of "LADY DEATH". The Lady Death art displayed above is a beautifully hand-rendered unique drawing by Pantalena in pen with copic shading (back page of sketchbook) and is not preprinted. Sketchbook is signed by Pantalena on the front cover in gold ink. This is a unique one-of-a-kind drawing by this star artist! P lease Note: the "IMAGE FOR DISPLAY PURPOSES" statement DOES NOT appear on the actual art! 40 Pages - Spiral Bound Format Sketchbook measures 6"x8-1/2" (15cm x 21cm) Sharp Near Mint Condition A must have for fans of this talented artist! The item "PAOLO PANTALENA SDCC SKETCHBOOK WITH ORIGINAL ART LADY DEATH DRAWING" is in sale since Saturday, August 12, 2017. This item is in the category "Collectibles\Comics\Original Comic Art\Drawings, Sketches". The seller is "x-worldcollectibles" and is located in Dublin, California.